Brewer's Yeast Tablets - 650 mg, 200 vegetarian tablets each (Nature's Wonderland) - Penn Herb Co. Ltd.
Fuel your active lifestyle with Brewer's Yeast! The nutritious whole food is a source of naturally occurring protein and energy-supporting B vitamins. So if you've missed out on Brewer's Yeast because of its strong taste, get Nature's Wonderland's premium quality Brewer's Yeast tablets for performance, convenience and unbeatable value! Supports healthy energy levels; supports healthy blood sugar metabolism (source of naturally-occurring GTF Chromium). 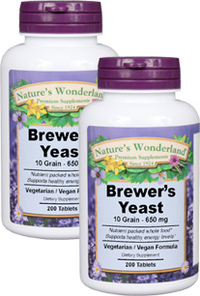 Brewer's Yeast has naturally occurring B-vitamins such as: Thiamin (Vitamin B-1), Riboflavin (Vitamin B-2), Niacin, Vitamin B-6, Folic Acid, Vitamin B-12, Biotin and Pantothenic Acid. It also offers amino acids and beta glucans. As a dietary supplement, take 3 tablets three times daily. SEE PDF LABEL FOR CAUTIONS.